Hydrangeas are a no-fail shrub for Northwest gardens. Flower colors include white, pink, blue and lilac. A few are actually called “red” but the color is more an intense pink segueing into claret. Flowers can begin in shades of green, turning to deep blue, and finishing up in a shade of maroon. Leaves can be quite large and are usually oval or elliptical, with serrated edges. Oak-leaf hydrangeas sport oak-shaped leaves that turn brilliant red, orange and yellow in the fall. Hydrangea aspera leaves are nearly a foot long and 8 to 10 inches across, with a furry-velvet texture. A few hydrangea varieties have leaves that are fairly narrow and not more than 2-3 inches long. Last, but not least, you’ll even find a semi-evergreen variety of climbing hydrangea. Flower types include pinnate (cone-shaped masses of blooms), mophead and lacecap. The hydrangeas you see in nurseries and in local gardens originated (depending on the variety) in Japan, East Asia, Mexico, Chile, Argentina and the Mediterranean and have been cultivated into even more varieties in France, Germany, England and the United States. 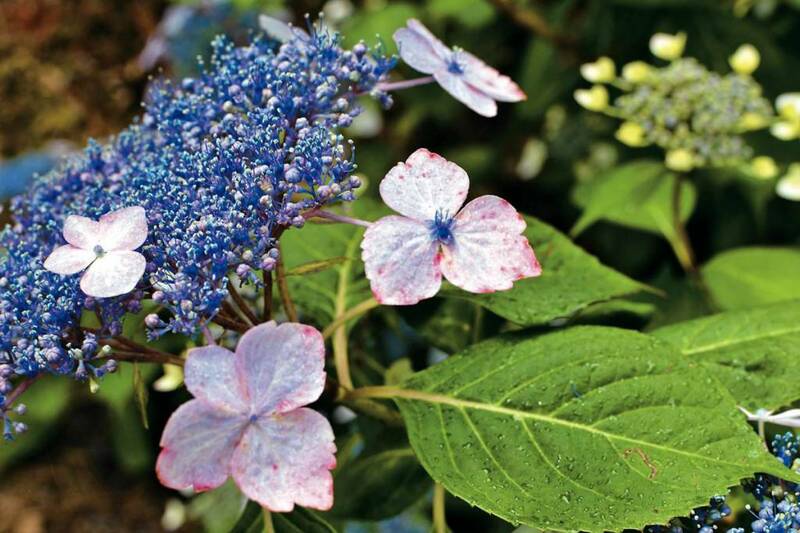 Hydrangeas thrive in the acidic, humus-rich soils found in West Sound. Some will not appreciate full sun or a spot that gets hot afternoon heat and sun. Oakleaf hydrangeas can tolerate more sun than other varieties and will show more color in the fall if they receive at least six hours of sun a day. Some varieties like dappled shade or morning sun. 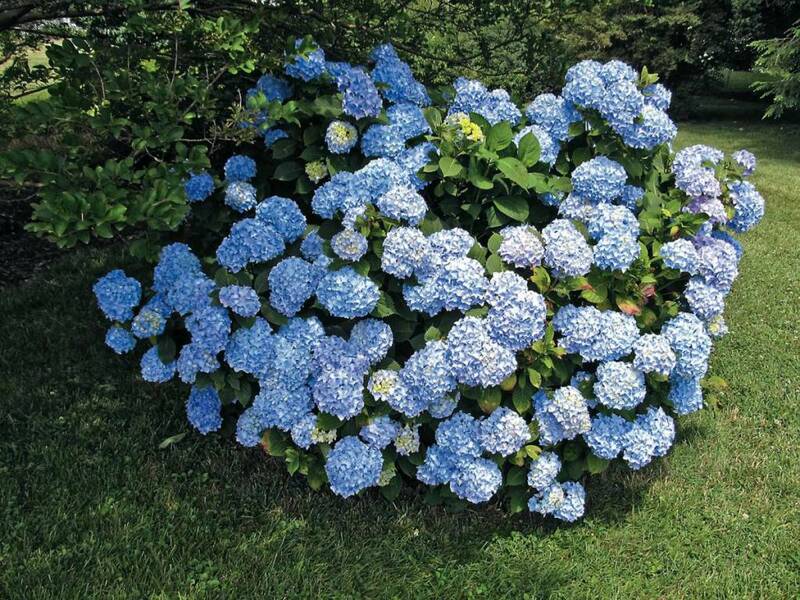 All hydrangeas need regular watering in summer until they are established. You will be able to find a hydrangea to meet nearly any light requirement. 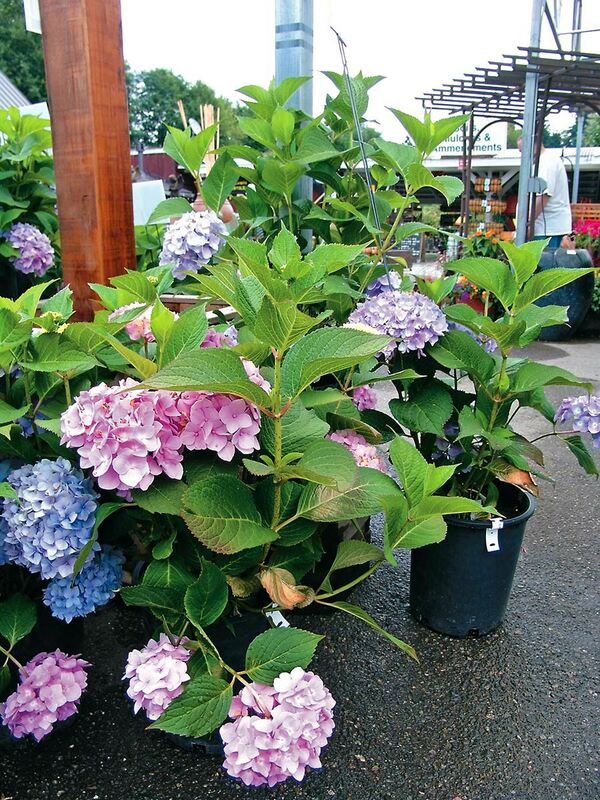 Gardeners have been known to manipulate the color of hydrangeas by changing the soil acidity. Many of the new cultivars on the market now will remain true to their colors and won’t need manipulating. Many hydrangeas bloom on old wood. However, new cultivars are being produced where the plant can be pruned and will still bloom the following year. Hydrangeas seem to thrive on neglect but can become leggy. When pruning is needed, remove only one-third of the plant’s stems at a time by cutting them down to the ground. Experts’ opinions vary on whether to prune in the fall or in the spring. Waiting until March seems to be the preference of most Northwest gardeners but in some years when hydrangeas flop around excessively, it’s fine to trim them back during winter months. Hydrangeas splash autumn with flashes of color, providing abundant choices to decorate your gardens with four-season color. Check out a few of the following beauties and then choose your own favorites to enhance your garden. Hydrangea arborescens “Annabelle” is the snowball hydrangea you likely remember from your mother’s or grandmother’s gardens. 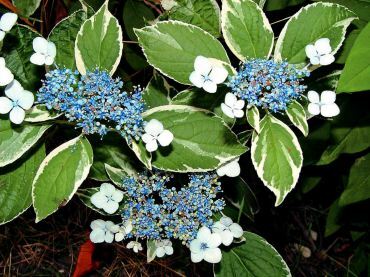 The flowers look almost greenish when emerging, turning to creamy white, and the shrub is frost-hardy and tolerant of light shade but does fine in sun, too. This shrub does best when allowed to grow in plenty of space. It will, however, tolerate pruning; but if you can, give it plenty of room instead. 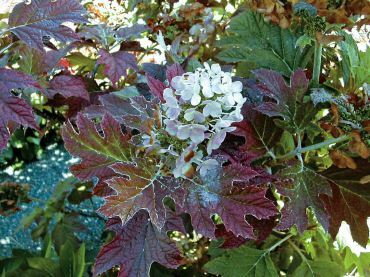 Hydrangea quercifolia (oakleaf hydrangea) is a tall, fairly narrow but sometimes floppy plant with large, oak-shaped leaves turning purple, amber, orange and claret red in fall. Over time, this shrub can reach 6 to 8 feet. Elongated, white flowers turn various shades of purple and magenta as they age. Textured bark adds more interest. Hydrangea aspera can grow into a small, 10- to 12-foot tree as wide as it is tall. It, too, has peeling bark. Give it plenty of room to sprawl. Roadhouse Nursery in Poulsbo has a huge H. aspera nearly touching the top of a barn on the property. Leaves are very large ovals covered with a velvety coat. Flower clusters have mostly fertile flowers, with sprinklings of sterile flowers around the edges. Flowers can be white, pink, mauve and lavender. H. aspera sargentiana has white sterile flowers and H. aspera “Villosa” has pink and lavender sterile flowers. Emerging buds and opening flowers are sheathed in velvet. This is a plant you’ll want to pet each time you pass by. 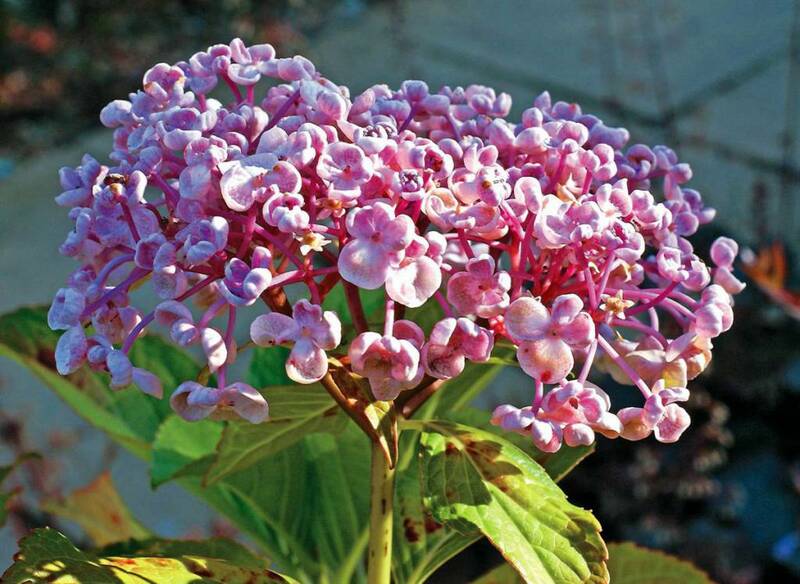 Try to find Hydrangea macrophylla “Ayesha” or a similar variety. This cultivar has small clusters of flowers and each one is indented, cuplike. You’ll find this hydrangea in shades of white, blue or pink. It’s hard to describe the flowers but you’ll know them when you see them. The flowers are scented and each cluster is somewhat stiff. 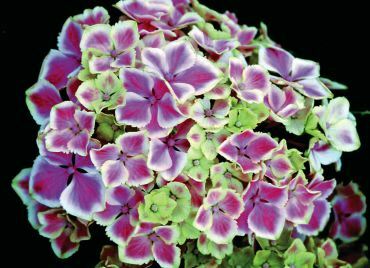 Striking and tempting are the only words to give a flavor of this variety of hydrangea. For a red-pink variety, try H. macrophylla “Pia.” This small shrub usually grows no more than 3 feet tall and sprawls delightfully. It’s perfect for rockeries or even for growing in a container. The green leaves turn red-brown in the fall. Blooms dry wonderfully and are good in dried arrangements. The only caveat is that sometimes the plant can end up growing into a big shrub. Hydrangea macrophylla “Harlequin” is quite interesting because flowers are pink with a white rim. It’s as if someone took a paintbrush and applied a white edging to all the flowers. Many older gardens are home to one or more huge blue mophead hydrangeas. 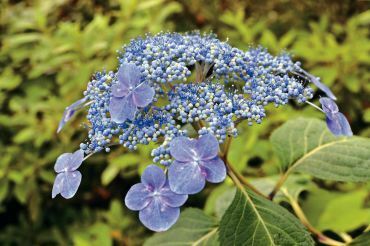 The names of these varieties are lost to us, but everyone who sees the gorgeous blue blooms covets these plants. Often the flowers will change from green to blue, to deep purple, to crimson as the plant blooms through the months of summer and into fall. These hydrangeas are even lovely as the blossoms become pale and papery when the weather chills. The faded parchment blossoms atop the bare, wheat-colored stems add interest all winter long. Hydrangea seratta “Preziosa” is an all-time favorite of many gardeners. The smooth stems are deepest burgundy. Leaves are darkest forest green. Flowers are small, rounded mopheads ranging from palest pink to palest lavender, with multicolors all on the same plant. Sometimes the blooms change from white to blue and then into pink, followed by lavender. As the season progresses, the flowers and leaves deepen in intensity, becoming deep, rich merlot. When you see H. seratta “Preziosa,” you’ll want it, too. Are you tempted to add a hydrangea or two to your garden? For more information, find “Hydrangeas — A Gardeners Guide” revised edition by Toni Lawson-Hall and Brian Rothera (Timber Press). “Hydrangeas” by Daria Price Bowman (Friedman/Fairfax) is a great pictorial book with colorful photos on every page. Hydrangeas Plus Nursery in Oregon at www.hydrangeasplus.com has an informative website where you’ll be able to subscribe to an email newsletter or look through the newsletter archives online for hydrangea lore and information. The American Hydrangea Society has information at www.americanhydrangeasociety.org. 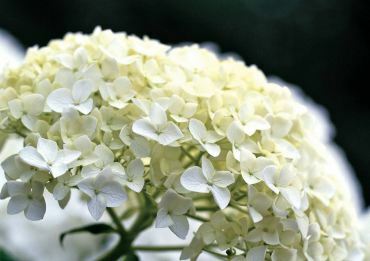 Also try www.hydrangeashydrangeas.com maintained by horticulturist Judith King. 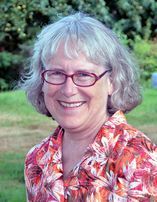 This article by Peg Tillery first appeared on the Rainyside Garden website.